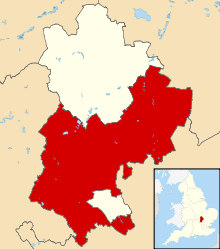 Central Bedfordshire is a unitary authority area in the ceremonial county of Bedfordshire, England. It was created from the merger of Mid Bedfordshire and South Bedfordshire District Councils on 1 April 2009. With a budget of £500m the unitary council provides over a hundred services to a quarter of a million people, and is responsible for schools, social services, rubbish collection, roads, planning, leisure centres, libraries, care homes and more. On 6 March 2008 the DCLG, under Labour Party Secretary of State, Hazel Blears, decided to implement Proposal 2. This meant that from 1 April 2009 there would be three unitary authorities in Bedfordshire: Bedford, Luton and Central Bedfordshire. Bedfordshire County Council challenged this decision in the High Court but on 4 April 2008 it was announced the Judicial Review had failed and the County Council would not appeal. Subsequently, a shadow council for Central Bedfordshire was formed from all the members of Mid and South Bedfordshire councils, as well as all Bedfordshire County Council members from the Central Bedfordshire area. The inaugural meeting of the shadow council was held on 10 April 2008. A shadow Executive for the council was formed consisting of four members of each council, led by the former leader of Mid Bedfordshire District Council. ^ "Welcome to Central Bedfordshire Council". Centralbedfordshire.gov.uk. Archived from the original on 16 February 2009. Retrieved 6 August 2012. ^ Bedfordshire County Council: High Court backs two unitary authorities for Bedfordshire Archived 16 November 2008 at the Wayback Machine. ^ "County Council Fails in Legal Challenge To Unitary Status". Bedford.gov.uk. 1 April 2009. Archived from the original on 13 February 2012. Retrieved 6 August 2012. ^ Unitary solution confirmed for Bedfordshire – New flagship unitary councils approved for Cheshire – Corporate – Communities and Local Government Archived 22 November 2008 at the Wayback Machine. ^ "County council to be abolished in shake-up". Bedford Today. 6 March 2008. Retrieved 6 August 2012. ^ "Central Bedfordshire Council: Election results by party, 4 June 2009". Centralbedfordshire.gov.uk. 4 June 2009. Retrieved 6 August 2012. ^ "Election 2009 | Central Bedfordshire council". BBC News. 5 June 2009. Archived from the original on 8 June 2009. Retrieved 6 August 2012. ^ "Central Bedfordshire Council: Election results". Centralbedfordshire.gov.uk. Archived from the original on 28 September 2014. Retrieved 2 January 2015. ^ "BBC News - Election 2011 - England council elections - Central Bedfordshire". BBC News. 10 May 2011. Archived from the original on 23 January 2016. Retrieved 2 January 2015. ^ "Central Bedfordshire Council: Election results". Centralbedfordshire.gov.uk. Archived from the original on 28 September 2014. Retrieved 3 June 2015.